Kahalu'u Beach Park is one of those delightful family-friendly Hawaii beaches with lots to see and do. The beach consists of coarse salt & pepper sand with good swimming and plenty of trees for shade. 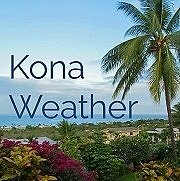 It is very easy to access, just 5 miles south of Kona on Ali'i drive. 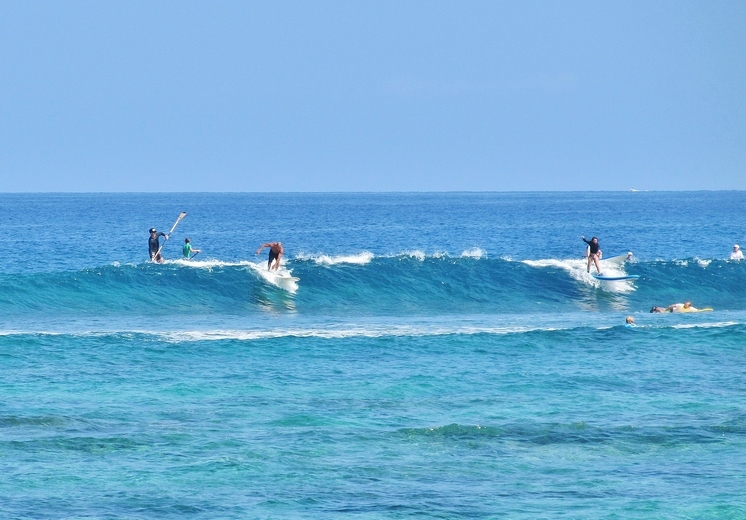 While the beach at Kahalu'u may not be at the top of our list of best Big Island beaches, what this area is most famous for is some of the best Hawaii snorkeling. The bay is well protected by a lava breakwater and the water is clear and shallow. There are tons of tropical fish everywhere you look, and a wonderful coral reef out near the lava breakwater. This is a very popular spot for snorkeling, so don't expect to have the place to yourself! The ocean around Kahalu'u is usually quite calm, good both for snorkeling and for young kids who want to swim without getting tossed around. Keep an eye on the weather as the water can get a little murky when there are ocean swells. The water closest to shore tends to be colder and a bit cloudy because of many freshwater springs nearby. You will find warmer and clearer water if you swim out a short distance, and also more fish and other interesting sea life. We sometimes see dolphins swimming just past the breakwater. 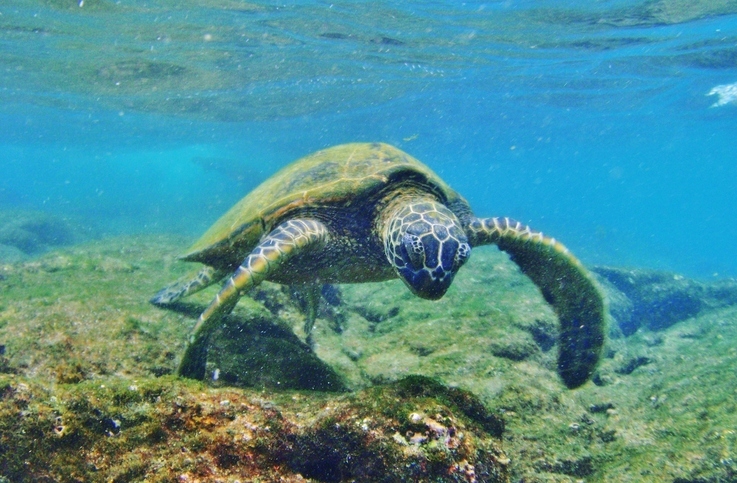 We almost always spot honu (green sea turtles) swimming right alongside, or resting on the lava rocks close to shore. The waves break toward the north end of the bay which makes it a popular area for surfing. During high surf, be wary of large waves washing over the reef, creating a strong rip current at the north end of the bay. 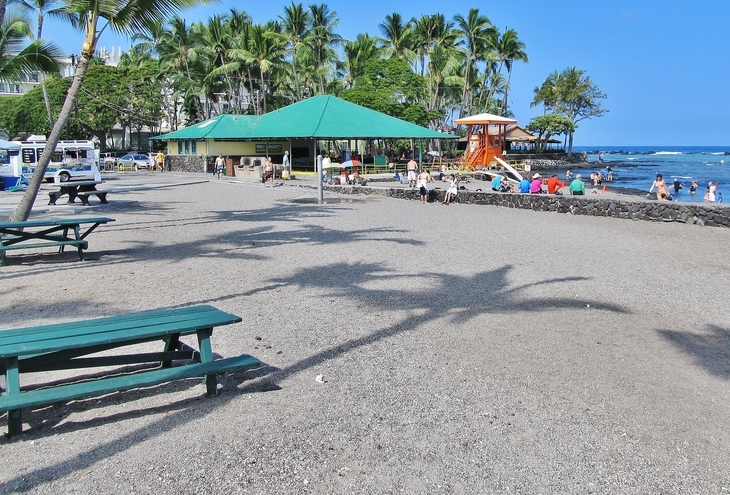 Kahalu'u Park includes picnic tables, a covered pavilion, outdoor showers, bathroom facilities and a lifeguard tower. Most days there are concessionaires where you can rent snorkel gear right at the beach. They also sell burgers and yummy shave ice, a perfect way to cool down on a hot day. All this makes Kahalu'u one of the best family beaches on the Big Island. Kahalu'u is located south of Kona, right before the 5 mile marker on Ali'i drive. Easiest access is from Kamehameha III Road, off of Highway 11 south of Kona. At the bottom of the hill turn right at Keauhou Shopping Center onto Ali'i Drive, continue about 1/2 mile (.8 km) to the beach. Like most popular Hawaii beaches this park can get quite crowded and the free parking lot will fill up. Try to arrive early or you may need to wait until someone leaves or park down the road. 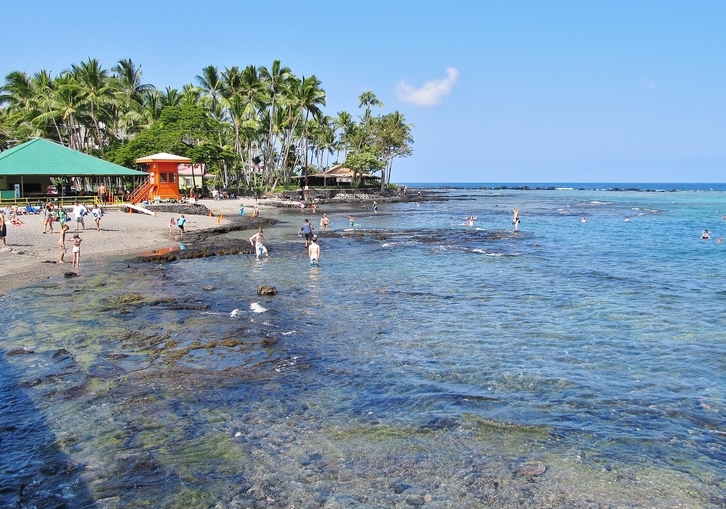 A trip to Kahalu'u Beach Park is a must for anyone snorkeling the Big Island. Enjoy this delightful beach and have a great time in the water!